It’s a time people around the globe hold their breath for – in anticipation of the fresh arrival -…… ahhhhh – wonderful beautiful Spring Time., new beginnings, babies being born.. it’s great! And the blooms everywhere are breath taking in central California where we live, the wildflowers and yards all colorful and inviting. Springtime colors are fantastic – What springtime story do you have to tell, what glorious spring time palette items do you have to share? We want to hear and see them! Spring is one of my favorite seasons because of its lovely color scheme! Most of my favorite (and best-selling!) products feature a spring color palette, such as these baby slouch boots. Because I knew these would be worn as the weather starts warming up, I made the shaft a bit shorter and the colors a bit brighter and lighter! No better baby shower or new mom gift, am I right? I absolutely love spring – so much so that I got married in spring and just had a spring baby! The colours around this time of year are so pretty from bold and vibrant colours, to more subtle and delicate hues – it’s all so inspiring for my knits! My absolute favourite tree comes into bloom this season too – the Cherry Blossom. It’s beautiful pink shades were the colour inspiration for this lovely and long, pure wool chunky knit scarf, which is handy because if your springtime is anything like ours here in the UK, you may still need some woolly warmers handy! We are getting some rain – those lovely April showers that bring May flowers! This is one of my newer paper packs, and I love the colors and the polka dots. I think they would be good for making spring birthday cards, or Easter egg hunt scrapbooking pages. My favorite time of the year is spring. I love to see the colorful flowers popping out and watch the trees become their vibrant green again. Spring washes away the dark winter colors and brings a fresh new palette that one can’t help but fall in love with and feel a sense of revival. The spring weather also is something I enjoy if it doesn’t bring endless days of rain. It seems warmer than winter but cooler than summer. It’s like a paradise I can get lost in. Everyone just loves spring because of the beauty you see each day and yes I must agree it is a beautiful time of year, but it is also a destructive time too. What I enjoy about spring is all the beautiful colors I see each day around my home. This evening while I was out watering the azaleas I managed to enjoy the whiff that I got of the lily of the valley or could it of been the lilacs that were in bloom too? So many beautiful bushes are blooming earlier than expected this year, just like some of the peonies. All their colors are represented in my multi-strand necklace. It is made up of seed beads with a variety of small beads. This necklace can be worn draped or twisted and yes, let the compliments begin. Our purple iris are blooming right now. We have purple on purple, white on purple, and some very dark almost black purple iris. Very beautiful and they smell wonderful! This necklace mimics the colors of the white on purple variety. I love spring , when the garden season begin. The fresh colors of the tulips, narcissus and hyacinth. A few years ago I created a vegetable garden. I can not wait to plant the vegetables which I have grown in the house from seeds into the garden. Spring is the time when I can paint flowers. I paint flowers by nature, not from photographs and I’m waiting all year for it. Now so lush everything is blooming and daylight is best for painting. I use natural daylight so colors are so real and juicy. I make a lot of quick sketches on specially primed paper and also paint large flower arrangements on canvas. Flowers are so inspirational! It’s Autumn all the way down here (Australia! ), but it’s so nice to see the beautiful Spring colours and flowers you’re all sharing. Przemila – how nice that you paint your flowers from nature – knowing that makes them even more lovely! This turquoise glaze always reminds me of a fresh morning in Spring. It always brightens my day to wear such a happy colour. We see them in many do-it-yourself blogs.. the cute half broken Terra-Cotta pots with mini fairy gardens…the little wooden fairy doorways to nowhere, star dust land I suppose! And even the fairyland accessories at the local craft store. Has anyone taken this to a new height, or do you have items in your shops for fairy garden use? Show us your gnomes, fairies, mushrooms and the like…we’d love to see them! I love fairy gardens! Well, I love miniature things to collect and to sell. My niece loves fairies and decorates her room with them, so I am always looking for a cute little one to add to her collection. This would be great in a fairy garden. I was thinking about the items in my craft and vintage shop…fairy garden? Ahh a subject dear to our hearts.. coffee! What do you carry in your shop that is coffee-colored or related – we’d just love to see it! Show our readers your vintage coffee items, plus coffee and espresso colored listings – and of course, include your wonderful coffee related stories. I used to drink coffee by the gallon, but then one ran out milk (because the kids drank it all) so had a cup of black tea …. that was about ten years go and haven’t drank coffee since!! But I do love the colour and smell of coffee, especially fresh beans. These beads remind me of the shape and colour of fresh coffee beans, and are ideal for a range of jewellery making and craft projects. Plastic Barrel Beads – wood look! Our stainless steel travel mugs are available in a variety of colors, can be personalized with any of our design and font combinations, and we offer engraving on both sides of the mug. We encourage everyone to stop using disposable cups! Personalize your mug and you never have to worry which cup is yours again. Choose the design and font to fit your personal. We love coffee, tea, wine, beer, & spirits and offer a number of monogramming options for any occasion or recipient. Ship direct with gift wrap and cards available, custom orders accepted for logos or inspired designs. Make your next gift a personalized gift experience @DesignstheLimit. I love my organic mild smooth blend cup of coffee a day. When I saw this fabric print I just knew coffee lovers whom were also dog lovers would totally love this dog bandanna. The bandanna shows off different styles of java, alternative names we use for coffee and there are a few coffee beans sprinkled around just making you want that coffee break just to inhale that freshness! The best coffee is the first cup of coffee in the morning! I love to drink coffee in all variations: black, cappuccino, latte macchiato. This cap is made from a used coffee bean sac. I get the bags from a coffee trader and it is so interesting when I get them. I don’t know the lettering, some bags have the typical hole where the coffee is tested and when I cut out the seams to prepare the burlap for the project I find coffee beans inside. This handmade mug not only holds a generous cup of coffee but the rim is also a sumptuous coffee colour. Being fired to stoneware temperature (1300C) this mug holds the heat of your hot beverage and is also oven safe, microwave safe and dishwasher safe. What is the key to your ideal cup of coffee? Is a strong version that is dark in color like the dark brown on these beaded dangle earrings? Perhaps you’re the type who needs to add a little creamer? I’ve got that covered (in color) with the smaller seed beads too! Prepared just right, coffee resembles satin to the soul! Which by the way is the type of focal bead made to design these earrings! Start your morning right – take time to stop and smell the coffee! Instant coffee is fine when you’re rushing out to work on a weekday, but after dinner and at the weekend you deserve the real thing. If you’re the kind of person who makes a big cafetiere of coffee and settles down with the papers on a Sunday morning, then this is for you: a beautiful Harris tweed cosy to keep the rest of the coffee warm while you take your time enjoying the first cup. Don’t forget the cream. In my house the creamer is just as important as the coffee. No skim milk for us! It has to be half and half with fat – no fat free. We want to enjoy the cup of coffee. Here is a large Mexican creamer so we can refill our coffee with good creamer. The sock color is light espresso. Dressed for the outdoors on those very cold mornings these all wool socks will keep your feet extra warm as you are out and on the go and when you need a quick pick me up, I find one of those Starbucks Frappuccino’s to be a great treat! Just enough espresso and you are charged and ready to run! I love coffee! Especially freshly brewed early in the morning. This coffee cup features one of my life drawing sketches. I’m posting this while drinking my fair trade organic coffee this morning. I love the smell of coffee, the look of it in a nice big mug. And, it does have to have plenty of cream in it. Doesn’t having a cuppa just make you take a moment to be grateful and mindful of the simple things in life? And, no dinner party is complete with a cup of coffee after dinner with a lovely dessert. I love my cup of coffee in the morning ! Nothing better then that first sip. It has to be just the right color with the perfect amount of cream added, not too little not too much just the right ivory color. I came to appreciate coffee in my 30’s, and gradually evolved from flavored instant varieties (the horror!) to custom blends brewed with a hint of cinnamon. But I still love going out for a hold-in-your-hands cafe-au-lait style mug, with the swirling designs made by an artistic barista. These earrings remind me of those lovely cafe trips. I love when an author describes a character and uses names for skin color that immediately resonate with the visual artisit in me. So, when I saw the title of this thread, I immediately thought of my Turban Girl and the warm cafe au lait tones to her skin. As soon as I laid eyes on these handmade glass beads, I knew coffee and cream was the most apt description! Now the owner of this necklace can be reminded of the great brew each time the necklace is worn! I love coffee and love collecting fun and unique coffee mugs for myself and for repurposing. This colorful mug includes birds in the pattern so it lent itself to becoming a bird feeder! I combined it with a vintage saucer that features a coffee colored pattern too! Well, I don’t drink coffee at all and am a cocoa and tea lover! I think that pretty gifts including gourmet coffees, teas, cocoas and snacks are a nice way to greet your host and or hostess when you are invited over for beverages, snacks and meals! This vintage ceramic basket is a nice coffee color and would be great to bring with you to a friend’s or relative’s home wrapped up with gourmet coffees and teas, etc. for a special, thoughtful gift! I am a coffee addict. Well, I drink my honey and creme with coffee in it! This necklace is Red Creek jasper nuggets, accented with turquoise and coral beads, and genuine brass beads. Great fall colors or to accent turquoise and coral as a layering necklace. Okay who has some pastel sparkle We want to hear about it! If you have Pastel items, sparkle items and a story to match, please share. I love sparkly things! What woman doesn’t? These are round sparkly glittered glass domes set in antiqued brass crown settings. Turquoise is my favorite color too! Perfect for an evening out with friends or just for a weekend trip. Oh yes do I have sparkle! These sequins are gold and feature an amazing shimmer surface that sparkles in the light. They are great for adding bling and pizzazz to clothing, accessories, handbags, quilts, wedding favours, table decorations and an array of craft projects, including jewellery. The sequins can be sewn onto fabric, canvas, leather and vinyl. I definitely love sparkle!! I also love bohemian leather wrap bracelets. But, being the sparkle lover that I am, I just had to make mine shine. I am loving the light blue pastel glass pearls in this bracelet. The shiny silver toned button clasp adds extra sparkle, too. This bracelet is perfect for the Bohemian Princess who wants to shine lol! Soft yellow is a perfect spring color. This is a vintage candy holder made of paper mache! 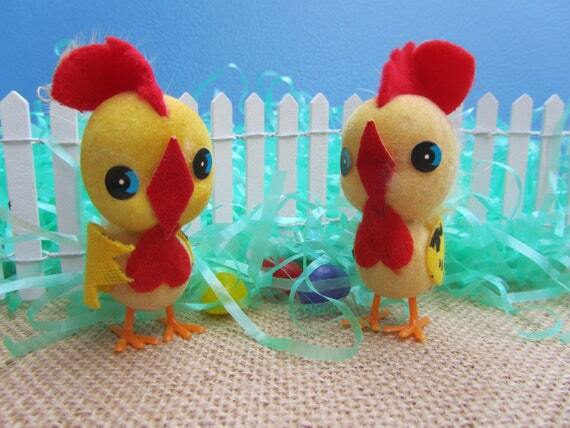 Great Easter Spring decoration! My daughter and I love the charm of vintage Gurley candles! Fun novelty decor for the table or Spring vignettes. Perfect for springtime! This sparkly necklace features an eclectic mix of repurposed vintage and new beads to give it a unique look. The colors are great for accenting this spring’s shades of greenery and pale dogwood. The touch of sparkle makes it a fun everyday accessory or sparkling accent for a special occasion or spring wedding! This digital paper pack was fun to create! Not only did I get to make bubbles, but I got to add sparkle! Bubble art seems to be popular these days, and so is anything with glitter or sparkle. It would be fun to use this paper for greeting cards, invitations or scrapbooking! What is so enchanting about this Pastel Sparkle Necklace is all the interesting beads that catch your eyes – whether they are the Freshwater Pearls or Glass Pearls, Citrine, Aqua Table Glass, Seed Beads or Sea Glass, Glass Chips, Rose Quartz or even Amber Beads all have a unique feel and glow! Multi Strands of One of A Kind Fun! cake toppers, centerpieces stand out. Pastel pops up in window displays at clothing stores. As the sun warms up the grounds, bluebonnets start to bloom across Texas along with the birds, bees and jackrabbits bouncing about here in the country. Easter is just around the corner. Enjoy a pretty in pink Easter bunny to your table decor with some pastel spring pink! The sparkle and contrast of silver faceted beads against the gold hoops exemplifies understated elegance. Brides and grooms sparkle when they turn around and face their loved ones for the first time as man and wife! The children on this little plate exemplify this truth with their sweet young faces filled with love in their hearts for each other and the world around them! The pastels are perfectly displayed in baby blues and pinks. How young we are when we first fall in love! Druzy gemstones are hundreds of sparking little gemstones that catch the light. I’ve chosen a minimalist necklace design to let the druzy be the focal point. Blue is such a bright and happy color for Spring/Summer and all year round. There are 2 styles for you to choose from. Pink is soft but this cute sparkly print is strong too! Sparkly skulls and stars and crossbones for the cool rocker personality! Makes a great gift for teens or edgy moms! Anklets are so flattering and flirtatious. This pastel peach chain is a delightful spring color. Add some sparkly freshwater peach pearls, light blue vintage Lucite Moonglow and tiny frosted Aurora Borealis seed beads for beach worthy perfection. Aurora Borealis is a trade name used to describe a kind of finish that was introduced in the mid-fifties. Named after the spectacular play of the northern lights, this innovation became a success worldwide and started a fashion trend of coating stones in a variety of colors with shimmering effects. Lucite appeared in many forms, colors and styles in jewelry as early as the 1940s. It is an acrylic resin, and one type of thermoset plastic, Bakelite is another. One of the most popular forms of Lucite, Moonglow pieces look as if lit from within. It is this quirky combination of materials that makes this a truly unique piece. This cute little wristlet is all dressed in her pastel colors of pink and blue. I’ve gotten so many request for anything with cute, adorable pigs and finally found a print I love. This little beauty in all it’s pastel glory would be the highlight in your little girls eye or anyone who has a love of those colors and pigs. At least with these pigs there are no smells and you can indeed carry them anywhere you go without leaving behind a mess. These pastel earrings feature handmade paper beads and pastel pink seed beads which shimmer in the light. They are a beautiful summer accessory for any outfit! Thank you everyone – a very impressive collection of sparkly pastel items. Our frames are sometimes painted in sparkly glitter paint (that does not rub off, it’s in the paint.) This board is a good example of bright fabric paired with a turquoise glitter frame for that sparkle effect we all love. I love this topic! I have many dream kitchen scenarios in my head and in the course of adulthood have had the pleasure of making some of those dreams reality. Right now my kitchen is a dreamy retro cafe with vintage radio and soda bottle collections, restaurant booths and even a Coca-Cola vending machine in the nearly dining room. To many the words DREAM KITCHEN means with all the bells and whistles – new appliances, granite countertops, plenty of storage space. To others this could mean just the perfect combination of space, themed decor and a breakfast nook to enjoy their mornings. What kind of dream kitchen do you envision or have you seen/visited over the years? We’d love to see your accompanying items and hear your stories. Well, I hate to cook, LOL! My idea of a Dream Kitchen or pretty one is a theme in pretty colors and of course a big enough one to eat in and decorate, LOL! So, for now how about a cheerful blue and white kitchen with an Asian theme and Oriental flare! On shelves above you can have Asian style artsy items in blue and white, maybe a wall hanging embroidered with the gorgeous Japanese style gardens that I have seen! Doors leading outside to a small Japanese themed herb garden with little stone pagodas and such! The table which is the center of most kitchens in many cultures can be set with bamboo place mats and a Chinese or Japanese fancy ginger jar or two, along with some bonsai trees and Oriental style flower arrangements! Then, set the table for tea with a pretty Asian teapot like mine I have posted below, matching tea cups, and have a relaxing time with friends having Asian cuisine and tea! I almost had a dream kitchen. I loved my re-wired 20’s stove and oven on legs. I was able to feed my cats under there. Ha! Loved it. I even had the old-time refrigerator with the motor up on the top. I decorated the tops of my cupboards with Hills Brothers Coffee Tins and every nook and cranny with Royal or Schilling Tins along with my red and white Hall Pottery collection. I added the red and white gingham curtains with white ruffles and black ribbon. Perfectly cute. Now I want to have a farmer sink and porcelain drain cupboards. I really don’t care if I have a dishwasher since the only thing that fits in them are plates which are the easiest items to wash. My coffee cups don’t even fit. As I mentioned before my tastes are changing but I still like the black, white and red accents. This is a fabulous decorator piece. It would look good in a modern, farm-house chic or even a retro kitchen. I’m sure someone would love to decorate with this nostalgic, workable food scale. Whether it’s in a grouping with other items such as fruit, flowers or utensils it will be sure to capture one’s eye. It is beautiful, intricate and in fine vintage condition. After we made the last college tuition payment for our son, I was fortunate to be able to remodel our dated kitchen! We now have gorgeous cherry cabinets, quartz counters and, my favorite feature, a Grohe “touch less” faucet! The contractor even honored my wish for a “curio” cabinet at one end of the island! It came out fantastic with wood shelving and glass doors. I enjoy displaying some of our Shop items inside. My daughter and I love finding retro (and kitschy) kitchen items, here is a cute trivet we found in Shipshewanna, Indiana. We are now just finishing a kitchen remodel. It is kind of a farmhouse style with white brick walls and hickory cabinets. Just some trimming out and hanging my wall decorations back up and Jim is done. But I love to cook and bake. So my favorite part of the new kitchen is a yellow painted peg board to hang up my cooking tools. Wire whisks, spatulas, ice cream scoops, tongs, etc. Julia Childs always have a peg board that her husband would put up where ever they lived in the world. I couldn’t wait for that piece to be done in my new yellow, green, and pine cone brown kitchen. And, these are my new old everyday dishes. It was a big set of a service of 16, so some have made there way into the shop. Love these cheerful items above! Really my dream kitchen is one that’s inviting and accommodates a lot of people. My kitchen right now is warm and inviting and our family loves it. The one thing that drives me crazy though is that our kitchen sink is right next to the back door, which is the door that everyone uses. So my dirty dishes are the first thing that people see!! When I win the lottery I’m definitely remodeling that!! Still, it seems the kitchen is the happiest place in our home! My dream kitchen would be centered around drinks and fun. I would have a very nice hot drinks bar where I can make all sorts of versions of coffee and tea. I would have an espresso machine, french press, electric kettle, and of course a way to brew a big pot of coffee. I want a wide selection of teas, from simple black teas to herbal remedies. Although I’m not a big alcohol drinker, I still would love to have a small alcohol bar as well. I want wines for special occasions and a couple of nice bottles of whiskey for my husband to have a glass now and then. My center bar would also have comfortable bar chairs for sitting to play board and card games with guests. The decor would reflect my family’s nerd love, fun and playful. My kitchen is very large, and I’m happy to say that we are well on our way to making this dream happen! We offer a variety of gifts for kitchen and entertaining, but nothing is more of a dream for preparing and serving than our personalized bruschetta set. We personalize one side of the board and you can turn it over to reveal a bread knife and bread board perfect for preparing bruschetta. Set even includes three ceramic dishes for self-serve appetizers in style! @DesignstheLimit we offer a wide variety of quality products as a canvas for our artistic personalization. We also offer an ever-expanding number of professional services including gift cards, engraved gift messaging on the underside of the board, and everything you need from graphic design to gift wrap to bring your ideas to your doorstep! I love all your dream kitchen ideas and your items.I would like to visit your dream kitchens, have a bite to eat, something nice to drink and warm company ,thanks everyone! It’ll be in the blog form soon. I think if I had an extra kitchen (because I love my chickens and roosters in the main cooking part of the present one) I think I would decorate with owls, this black and white one would be useful.. the counter-tops could be black marble and the back splashes white marble.